This attractive beaded cross necklace is a lovely craft for kids to make as an Easter gift or even as a project for Sunday School at any time of the year. Included below is one of many Easter crafts/projects I hope to eventually include on this page. When your kids finish this beautiful craft they will have a wonderful keepsake for that special someone in their life to have as a gift for this special holiday or they can simply keep it for themselves. Easter is a such a fun time for children, but they need to realize the true meaning of this holiday as they have their fun. Let's help our children know what Easter is all about with crafts such as this one that will help remind them of Jesus on the cross at Calvary. It is no wonder some kids get confused about what Easter is really about with all the jelly beans, cellophane-covered baskets, giant chocolate bunnies, egg coloring supplies and much more that is everywhere in most every local department store. Christmas is a little easier because at least you do see Jesus in a manger and the wise men out of all the other stuff for Christmas, but how do you explain to school children something as mysterious as the Resurrection? You can be creative with this such as on Good Friday color three dozen Easter using the eggs to represent new life by explaining how the little chick is hatched poking his way out with his beak. "A New Life" that is what we celebrate at Easter - the new life we have in Jesus Christ! You can include Bibles, Bible story books, cross necklaces, scripture stickers, bookmarks, prayer journals and so much more into their Easter baskets to help them remember what Easter really is about. Another great idea for a visual of the Resurrection is to give your Sunday School children or children at home caterpillars weeks prior to Easter. The children can watch them spin cocoons and then metamorphosing into butterflies. You can have the children release the butterflies just before Easter Sunday service. Afterwards, explain to the children that the cocoon was like Christ's death and entombment, and that His Resurrection was like the butterfly. 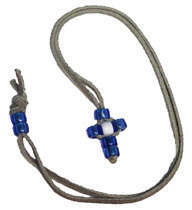 Return to Easter Ideas Page from Beaded Cross Necklace.